Although in some respects a very international artist, Ludovici worked and exhibited mainly in London; he observed the streets and parks there, especially at the height of the Season, and produced numbers of small panels with studies of fashionable London life. These relied on a visual shorthand which he had developed in order to record passing effects as swiftly as possible. The best of his work is in these very fresh and often rapidly-painted studies, which combine an articulation of space learned from Degas and Caillebotte with a sense of colour harmony derived from Whistler. 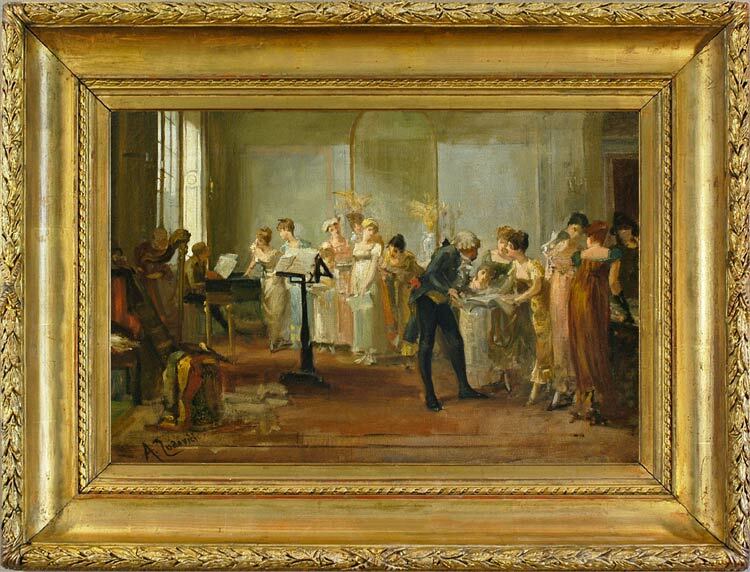 Such techniques fed into his other subjects, so that the costume paintings in which he followed his father, Albert Ludovici senior, vary from highly-finished images of social gatherings and courting couples in pseudo-18th century guise (similar to those of Marcus Stone), to this present charming depiction of a period concert, which combines a Regency interior, Impressionist brushwork and composition, and the colour aesthetics of Whistler. Albert Ludovici Jnr. (1852-1932) was born in Prague of Bolognese origins, although the family seems to have lived in England from his babyhood. He studied at the Académie Charles and the Ecole des Beaux Arts in Paris, where he was taught by Cabanel, Gérôme and Pils and his fellow pupils included Gervex, Forain and Bastien Lepage. He left Paris when the Prussians invaded, helping his father with the decorative painting of interiors which was his main source of income, but returned to Paris after the war to live by painting portraits. After his marriage in 1875 he settled in England and taught art – in a revolutionary step, to female pupils. In 1878 Ludovici joined the Society of British Artists, for which his father acted as Treasurer, and when Whistler was elected President of the Society (1886-8) Ludovici served on the committee. In 1886 Whistler took The Times to task for ignoring one of Ludovici’s paintings on exhibition in the SBA. Having been previously attracted by French naturalism and Impressionism, Ludovici was increasingly drawn to Whistler’s work; when the latter was elected President of the International Society, Ludovici became the Society’s delegate in France, so that the two men worked closely together, Whistler calling Albert, ‘My trusty Aide de Camp!’ Ludovici was able to secure Manet’s Execution of the Emperor Maximilian (National Gallery) for exhibition in London, in its whole state, before it was cut up by the dealer Durand-Ruel. He and Whistler remained firm friends and in 1899 visited Holland together with some of Ludovici’s pupils. Ludovici’s London scenes were greatly influenced by Whistler’s use of tone and colour; however, a contemporary critic remarked that Ludovici’s work sprang on ‘a lighter, gayer stem, that of his own artistic individuality’. He developed a visual shorthand in order to record these scenes en plein air; his first exhibition of this type of work, Dots, notes, spots, was held at the Dowdeswell Galleries, London, in 1888, and was favourably reviewed by George Bernard Shaw. He was a prolific artist; he exhibited at the Royal Academy from 1880, the Royal Society of British Artists from 1881, the Paris Salon from 1884, the New English Art Club from 1891, as well as the Grosvenor Gallery, the New Watercolour Society and the Société Internationale de la Peinture à l’Eau. Works in public collections include Adieu (Kirklees Museums & Galleries). See the on-line Correspondence of James McNeill Whistler, University of Glasgow, at http://www.whistler.arts.gla.ac.uk/correspondence/people/ ; Albert Ludovici, ‘The Whistlerian Dynasty at Suffolk Street’, Art Journal, July & Aug. 1906; Albert Ludovici, An Artist’s Life in London and Paris, 1870-1925, London 1926.